Now is the perfect time for investors to take stock of their investments. A simple but effective way to review your portfolio is to consider your allocations and whether you might be over or underweight certain asset classes. Has your portfolio become unbalanced? Even though your portfolio may have been well balanced when you first constructed it, it’s important to consider that your weightings can change over time. For example, you might end up having a greater allocation towards certain asset classes as a result of outperformance in a class. Meanwhile, your circumstances may have changed, requiring a reassessment. The purpose of rebalancing is to restore a mix that matches your investment goals, strategy, tolerance for risk and even stage of life. Fixed income is an asset class with an important role to play in well-balanced portfolios. Investors with lower risk tolerance, such as those who have passed the halfway mark of their careers, may need a more defensive portfolio. Even if your risk tolerance is higher, you may still benefit from de-risking your portfolio somewhat given the continued uncertainty of share markets going into 2017 and the potential for volatility. There has been a long-term tendency for Australian investors to be underweight defensive assets. But, it’s a trend that’s been gradually changing since the GFC. More and more investors now see the benefit of balance between shares and fixed income in their investment and Super portfolios. Total returns from bonds have beaten total returns from shares over the last 10 years because of the GFC and subsequent volatility in shares since 2008. So balanced portfolios should have performed better than portfolios based mainly on shares. Data from the ATO¹ shows that just over 1% of the $636 billion worth of assets in Australian SMSFs is invested in fixed income (meaning bonds), compared to 25% in cash. In contrast, the average fixed income allocation for Australia’s largest 10 super funds is 22%. Allocations to shares have been consistently around 28% to 30% for a number of years. If your portfolio aligns with the ATO data, there’s a good chance you might be overweight in shares or cash. The ASX 200 had annualised volatility around 15%. Fixed-rate investment grade corporate bonds are around 2-3%. Floating-rate investment grade corporate bonds are about 10 times more stable at around 0.2-0.3%. Hybrids sit in the middle at about 6% to 7% annualised volatility. Fixed income is the asset class that offers capital stability plus regular and known income. It’s ‘known’ income because bond issuers are obligated to pay the income on known dates, and they have no ability to alter this otherwise they’re in default. When you buy corporate or government bonds, you know the outcome of your investment on the day you invested provided the bond issuer does not get into financial difficulty. You don’t know this with shares and hybrids because dividends can be cut. 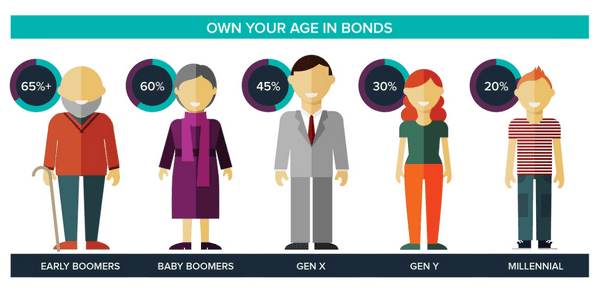 Do you own your age in bonds? A general rule of thumb is that balanced investment portfolios should include an increasing portion of fixed income as we move through life. “Own your age in bonds”, was a famous quote from John Bogle, the founder of global investor Vanguard. If you’re at the start of your career, then 20% fixed income may be the right balance. When you’re 40, and in mid-career, 40% starts to provide more defensive character to your portfolio. At 60 and coming up to retirement, you can’t afford to take a capital hit in the way you could absorb when you were 20, because your capital may take too long to recover. Retirees know this very well, because capital preservation is critical to them. For retirees defensive allocations of 70% and 80% make abundant sense. This is why balances at banks are at record highs. There is over $820 billion in household deposits recorded by APRA in late 2016. Relying mainly on equities to keep delivering year after year doesn’t make sense after the decade we’ve had since the GFC. Not only can the capital value fall, but companies can and do cut dividends, like BHP did last year. Dividends are driven by profits and profits are driven by the domestic and global economic outlook. There’s enough uncertainty on those fronts going into 2017 for older Australians, in particular, to think hard about how much they rely on dividends from equities to support their living standards. Hybrid dividends can also be cut. The company or bank is under no obligations to pay those either. Only senior bonds provide that surety because their terms give the bond issuer no flex on coupon payments. One of the historic reasons Australian investors had such low allocations to fixed income was the limited options available. There were very few fixed income options beyond managed funds and virtually nothing was available on ASX. But, this has all changed. There is now a much wider range of fixed income securities on ASX. 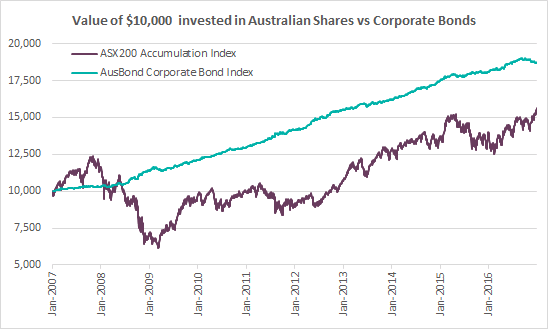 Bond ETFs, XTBs (Exchange-Traded Bond units) over individual corporate bonds and AGBs (Australian Government Bonds) over individual government bonds, have changed the fixed income landscape for investors. All investors can now get exposure to the returns of individual government and corporate bonds. With term deposit rates tracking interest rates down to all-time lows and continued sharemarket volatility, there is a growing need for higher yielding fixed income investments. Government bonds tend to offer lower yields than term deposits. But, XTBs over individual corporate bonds have yields ranging up to the low fives. On 3 Jan you could invest in a portfolio of higher yielding XTBs with an average yield of 4.16%2. The best 3 or 6-month term deposit on that day was offering 2.85%3. This is a 46% uplift over the best term deposit. You get extra yield for extra risk in lending money to ASX100 companies versus a bank. Term Deposits may enjoy the benefit of protection under the Financial Claims Scheme. A 46% uplift is significant for any investor and more so for retirees. In terms of capital, the long-term average price volatility is 2-3%. If you hold to maturity there is no capital risk (assuming no default). With an average term of between 3 and 4 years, the corporate bonds that XTB cover are not long-term investments. They will mature at $100 unless the ASX 100 listed company gets into financial difficulty and defaults, which is a low risk. And they can be sold on ASX just like other ASX traded securities. Compared to other fixed income such as cash and term deposits, corporate bonds can potentially offer higher returns without the volatility of shares or hybrids. If you’re looking to diversify your portfolio and bring more capital stability and regular income to your investments, they may be worth a closer look. Create a schedule for reviewing your portfolio regularly. It might be every quarter, twice a year or just once a year. Depending on what works for you, just make sure it’s locked in your diary. Consider seeking professional advice if you want to make sure you’re making smart investment decisions.